Abstract: Science faces an accessibility challenge. Although information/knowledge is fast becoming available to everyone around the world, the experience of science is significantly limited. One approach to solving this challenge is to democratize access to scientific tools. 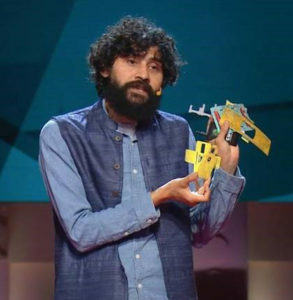 Manu Prakash believes this can be achieved via “Frugal science”; a philosophy that inspires design, development, and deployment of ultra-affordable yet powerful scientific tools for the masses. Using examples from his own work (Foldscope: one-dollar origami microscope, Paperfuge: a twenty-cent high-speed centrifuge), Dr. Prakash will describe the process of identifying challenges, designing solutions, and deploying these tools globally to enable open ended scientific curiosity/inquiries in communities around the world. By connecting the dots between science education, global health and environmental monitoring, he will explore the role of “simple” tools in advancing access to better human and planetary health in a resource limited world. Applying principles of soft-condensed matter physics to unravel microscale mysteries of living and nonliving matter and inventing affordable technologies for global education, health, and science explorations. Abstract: The laser increased the intensity of light that can be generated by orders of magnitude and thus brought about nonlinear optical interactions with matter. Chirped pulse amplification, also known as CPA, changed the intensity level by a few more orders of magnitude and helped usher in a new type of laser-matter interaction that is referred to as high-intensity laser physics. In this talk, I will discuss the differences between nonlinear optics and high-intensity laser physics. The development of CPA and why short, intense laser pulses can cut transparent material will also be included. I will also discuss future applications. Physics has long employed optical methods to probe and manipulate matter on scales from the infinitesimal to the immense. To understand the brain, we need to monitor physiological processes of single synapses as well as neural activity of a large number of networked neurons. Optical microscopy has emerged as an ideal tool in this quest, as it is capable of imaging neurons distributed over millimeter dimensions with sub-micron spatial resolution. Using concepts developed in astronomy and optics, my laboratory develops next-generation microscopy methods for imaging the brain at higher resolution, greater depth, and faster speed. By shaping the wavefront of the light, we have achieved synapse-level spatial resolution through the entire depth of the primary visual cortex, optimized microendoscopes for imaging deeply buried nuclei, and developed high-speed volumetric imaging methods. I will discuss our recent advances as well as their applications to understanding neural circuits. Na Ji studied chemistry and physics as an undergraduate in the University of Science and Technology of China and later a graduate student at the University of California, Berkeley. In 2006, she moved to Janelia Research Campus, Howard Hughes Medical Institute, and worked with Eric Betzig on improving the speed and resolution of in vivo brain imaging. She became a group leader at Janelia in 2011. In 2017, she moved to the Department of Physics and Department of Molecular & Cell Biology at the University of California, Berkeley as the Luis Alvarez Memorial Chair in Experimental Physics. 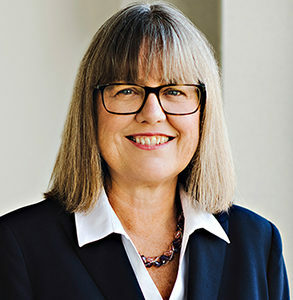 She is also affiliated with the Bioengineering, Biophysics, and Vision Science Graduate Programs, Helen Wills Neuroscience Institute, and serves as a faculty scientist at the Lawrence Berkeley National Laboratory. 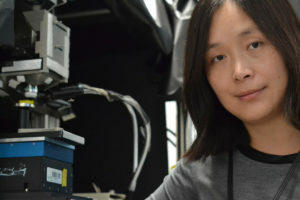 In addition to imaging technology development, her lab also applies the resulting techniques to outstanding problems in neurobiology. I will begin with a brief introduction to optical spectroscopy in semiconductors, emphasizing the analogy between impurities and excitations in semiconductors to aspects of atomic and particle physics. In this analogy, each semiconductor is a special vacuum in which the band gap energy is equivalent to the energy threshold for the production of an electron-positron pair in the real vacuum. The electron-hole pair created by the absorption of above band gap light are of course different in that the electron and hole can have different effective masses, but we can still think of them as antiparticles which can annihilate with the emission of a photon of light. However, all common semiconductors, including silicon upon which much of our computing, communication and entertainment technologies are based, differ from the real vacuum in that the energies of all excitations, and therefore the linewidths of all optical transitions, have as a limiting factor various inhomogeneous broadening mechanisms such as local electric and strain fields. Our discovery in 2001 that the linewidths of optical transitions in high-quality natural silicon was limited by inhomogeneous broadening due to the random placement of the three stable isotopes of silicon in the crystal lattice, and that inhomogeneous broadening could be essentially eliminated by the removal of silicon-29 and silicon-30, leaving only silicon-28, led to the coining of the phrase “semiconductor vacuum”. The availability of highly isotopically enriched silicon-28 has since led to a series of new discoveries, some of which overturned long-standing “facts” about defects in silicon. It also led to the realization that in silicon-28, some optical transitions, which were over 100 times sharper than in the best natural silicon, could be used to optically measure and prepare electronic and nuclear spins. These spins were already recognized as some of the most promising quantum bits, or qubits, on which to base future quantum computing and communications technologies. It further led to new ideas for single spin qubits in silicon that could by prepared and measured using spin/photon conversion involving cavity quantum electrodynamics, ideas which are being actively pursued at this time. Mike Thewalt obtained his BSc in physics from McMaster University in 1972, followed by a PhD from UBC in 1977, where he first became interested in optical spectroscopy in semiconductors. After two years as a postdoctoral fellow at the IBM T.J. Watson Research Center, he moved to SFU with the help of the new NSERC University Research Fellows program. He has consistently worked to push the bounds of spectroscopy in semiconductors by applying new technologies, developing new techniques, and investigating new materials. Thewalt has served as Chair of the CAP Division of Condensed Matter and Materials Physics, and as President of the CAP from 2001 to 2002. He has also served in many roles associated with the International Union of Pure and Applied Physics (IUPAP), and chaired its Commission on Semiconductors (C8) from 2011 to 2014. He is a fellow of the Royal Society of Canada (RSC), the American Physical Society, and The Institute of Physics (UK). His awards include the Rutherford Memorial Medal in Physics of the RSC, the CAP Medal for Lifetime Achievement in Physics, and the CAP/DCMMP Brockhouse Medal. This lecture will discuss why, despite over three decades of expressed commitment to equity, diversity and inclusion, there are few, if any, Canadian universities, departments, or disciplines that can be held up as exemplars of EDI. Most universities’ approach to EDI seem compliance-based, driven primarily, if not exclusively, by external requirements (e.g. Employment Equity Act, Federal Contractor’s Program, CRC Program). Today, more than ever, there is an urgency for universities to go well beyond compliance to meet the intersecting challenges of equity, diversity and decoloniality. While some scholar-activists juxtapose diversity and decoloniality, this lecture will argue that the two are interconnected and a more equitable academy is a more diverse one, and there can be no decolonized academy that is not, at the same time, more diverse and equitable. Among the urgent challenges to be addressed include leadership diversity, disaggregated and intersectional equity data, and a decolonized curriculum connected to both a diversity of bodies and bodies of knowledges. 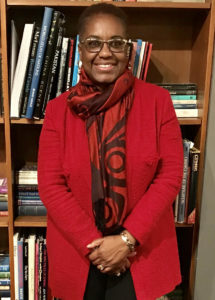 Dr. Malinda Smith is a Professor in the Department of Political Science at the University of Alberta, and a 2018 Pierre Elliott Trudeau Foundation Fellow, a 2018 Equity, Diversity and Inclusion Award winner, and a 2018-19 Provost Fellow in Equity, Diversity, and Inclusion Policy. Her research and engaged scholarship draws on critical theoretical perspectives in the social sciences and the humanities to explore questions of equity, human rights and social justice, African political economy and security studies, and diversity, decoloniality in higher education. Her recent published research is in several areas including diversity in theory and practice, and gender, critical race and intersectionality in higher education. Her coauthored book (with Ena Dua, Frances Henry, Carl James, Audrey Kobayashi, Peter Li, and Howard Ramos), The Equity Myth: Racialization and Indigeneity at Canadian Universities, was released in June 2017. Measurements of the Cosmic Microwave Background and the large-scale structure of the universe have made it possible to determine with great precision the universe’s inventory, as well as properties of its initial conditions. However, there are profound questions that remain unanswered. Cosmological observations and galaxy dynamics seem to imply that 84% of all matter in the universe is composed of dark matter, which is not accounted for by the Standard Model of particles. The particle nature of dark matter is one of the most intriguing puzzles of our time. The wealth of knowledge which is and will soon be available from cosmological surveys will reveal new information about our universe. I will discuss how we can use new and complementary data sets to improve our understanding of the particle nature of dark matter both at large and small scales. Prof. Dvorkin’s research focuses on “data-driven” cosmology: predictions from fundamental physics which can be tested with cosmological data. 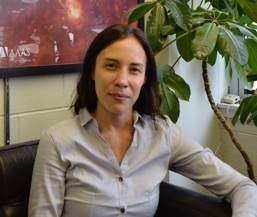 Her research interests span questions related to inflation, dark matter, dark energy, and neutrinos. To assess these questions, she uses data from the Cosmic Microwave Background and the large-scale structure of the universe. Prof. Dvorkin is currently the co-leader of the Inflation analysis group for the proposed next-generation CMB-S4 experiment. She has been named the “2018 Scientist of the year” by the Harvard Foundation for “Salient Contributions to Physics, Cosmology and STEM Education”. She has also been awarded a Radcliffe Institute Fellowship for 2018-2019 and a Shutzer Professorship at the Radcliffe Institute for the period 2015-2019. Professor Dvorkin, born and raised in Buenos Aires, Argentina, received her Diploma in Physics from the University of Buenos Aires with honors. She earned her Ph.D. in the Department of Physics at the University of Chicago in 2011, where she won the “Sydney Bloomenthal Fellowship for “outstanding performance in research”. She has conducted postdoctoral research at the School of Natural Sciences at the Institute for Advanced Study in Princeton (from 2011 to 2014) and at the Institute for Theory and Computation at the Center for Astrophysics at Harvard University (from 2014 to 2015), where she was both a Hubble Fellow and an ITC fellow. Despite being well-understood scientifically, the challenge of global warming remains hotly debated at the political and social level. I’ll talk about the historical foundations of the science of global warming and the range of projections of climate change over the next century. I’ll discuss the Canadian and International policy framework and the reason why I gave up my Tier 1 Canada Research Chair to run as an MLA for the BC Green Party. 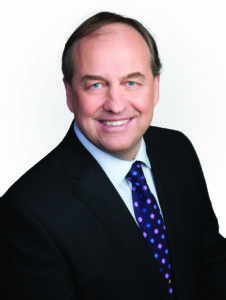 Born and raised in Victoria, BC, Dr. Andrew Weaver received a BSc in Mathematics & Physics from the University of Victoria (1983), a Certificate of Advanced Studies in Mathematics (Master of Advanced Study) from Cambridge University (1984), and a PhD in Applied Mathematics from the University of British Columbia (1987). Dr. Weaver is a Fellow of the Royal Society of Canada, Canadian Meteorological and Oceanographic Society, American Geophysical Union, American Association for the Advancement of Science and the American Meteorological Society. Dr. Weaver has received numerous awards, including the Killam Research Fellowship, a Guggenheim fellowship, the Royal Society of Canada Miroslaw Romanowski Medal, and the A.G. Huntsman Award for Excellence in Marine Science. He was appointed to the Order of British Columbia in 2008 and awarded the Queen’s Diamond Jubilee Medal in 2013. Elected in the 2013 provincial election in Oak Bay-Gordon Head, Dr. Weaver became the first Green Party Member of the Legislative Assembly in British Columbia’s history. Since December 2015, he has served as Leader of the BC Green Party and in 2017 he was elected to a 2nd term as MLA. 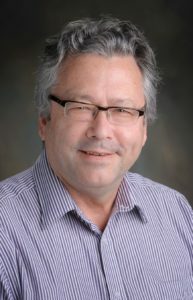 Prior to his election, Dr. Weaver served as Canada Research Chair in climate modelling and analysis in the School of Earth and Ocean Sciences at the University of Victoria. He was a Lead Author in the United Nations Intergovernmental Panel on Climate Change 2nd, 3rd, 4th and 5th scientific assessments.